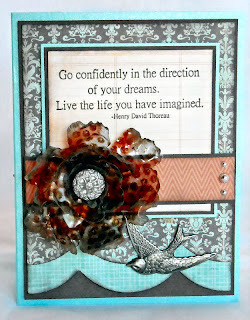 It's time for another Stampotique ONLY Challenge at the SDC Blog. This week Willy is the hostess and she's challenging you to use your Stampotique images with Acetate. I had a lot of different ideas floating around for acetate - Smackin' Acetate, Shaker Cards, Embossing Acetate, Clear Cards, but I wanted to try something different. In a past issue of The Technique Junkie Newsletter, there was a tutorial for Acetate Flowers - I never tried the technique, so I gave it a go. I'm thrilled with the outcome. I did morph the tech a bit, as I applied Alcohol Inks to my acetate. I used the Mojo Monday Sketch along with some fabby papers from My Minds Eye. The Stampotique sentiment can be found here. I stamped the Honeycomb Background in Coffee Archival on the Acetate and added some Ranger Espresso Acrylic Paint before heating the acetate. Grab your Stampotique stamps and play for a chance to win a $30 gift certificate to shop at Stampotique Originals. 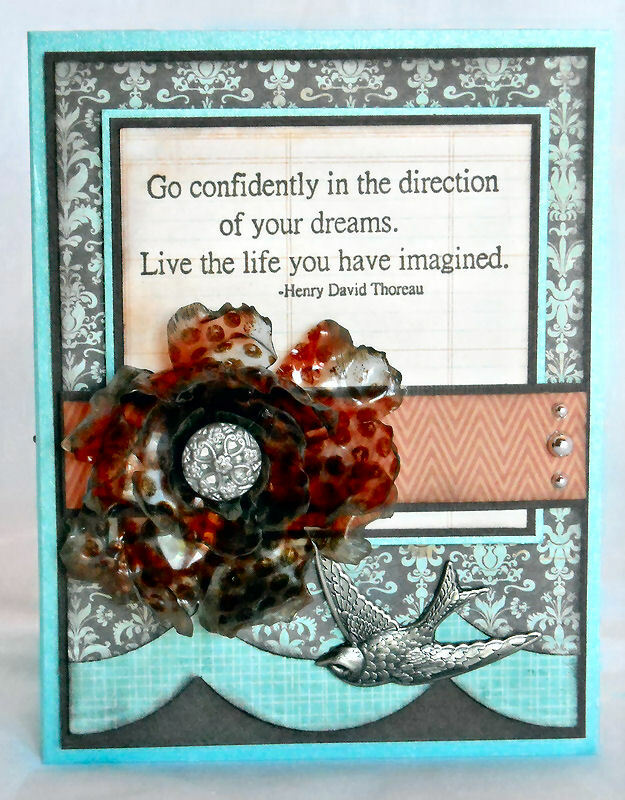 More details and inspiration can be found on the Stampotique Designers Challenge Blog. OMGosh, Lisa.....this is just awesome! I am in love with your card. Not only is the design, papers, colors, and sentiment gorgeous, but that flower is out of this world stunning! I adore every square millimeter of this! 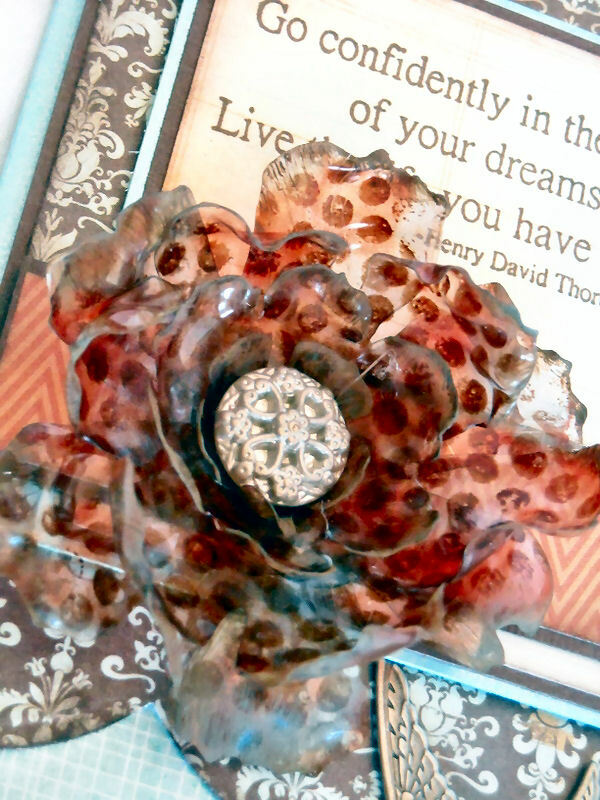 Beautiful acetate flowers and the heartfelt creations tutorial is great! Funky fun fer sure! Great flower and beautiful card. very cool looking flower. I was thinking myself of die cutting some acetate flowers. I adore how these flowers turned out, they look amazing!!! WOW Lisa! That's beautiful! Loads of creativity in this jewel! GORGEOUS flower and beautiful card. LOVE IT! I love your acetate flower, gorgeous card too. Great idea to use the alcohol inks with this technique too. Wow! That flower is amazing! I am in awe. So different and beautiful. Great use of acetate! Gorgeous flowers for a gorgeous card! Great design!